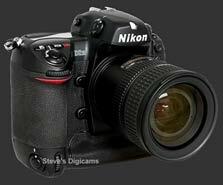 Nikon's new D2H professional digital SLR camera was designed for photojournalists and sports/action photographers. The D2H sets a new standard in speed and accuracy while achieving exceptional image quality. Virtually every aspect of the camera's performance has been designed from the ground up to facilitate high-speed photography under demanding conditions. The D2H is capable of continuously shooting 8 frames per second and buffers up to 40 JPEG images. It incorporates an all new 11-sensor autofocus system with 9 cross type sensors and versatile performance, a revolutionary new 4.1 effective megapixel imaging sensor and Wi-Fi capabilities for 802.11b wireless transmission of images. The D2H boasts an extensive new feature set that is designed for extreme performance at every level. The camera is central to a complete new imaging system for photojournalism and sports/action photography that includes Nikon Capture 4.0 software, new NikonView 6.1 software, new i-TTL speedlight technology, new WT-1 Wi-Fi transmitter accessory, and three exciting new lenses including the world's first extreme wide-angle AF DX Fisheye-Nikkor 10.5mm f/2.8G ED lens and the new AF-S DX Zoom-Nikkor 17-55mm f/2.8G IF-ED lens, both designed exclusively for Nikon digital SLR cameras, and the world's first super-telephoto AF-S VR 200-400mm f/4G IF-ED lens with Nikon's advanced Vibration Reduction technology designed for Nikon's 35mm and Digital SLR models. The new 4.1 effective megapixel (2484 x 1636) DX format JFET imaging sensor was designed to meet the challenging needs of photojournalists and sports/action photographers, and provides the foundation for the D2H system's advanced performance. The new sensor is capable of producing high quality images and high-speed performance. Its JFET technology, combined with a host of new innovations, enables this sensor to render extremely low noise performance with extraordinary color accuracy, detail, sharpness and overall quality. Auto white balance, auto tone control and auto color correction ensures optimal accuracy for each scene. A new color-processing engine minimizes false colors, while maintaining superior color rendition, accuracy and consistency. A high signal-to-noise ratio combined with high-level image processing offers enhanced performance at high ISO settings. 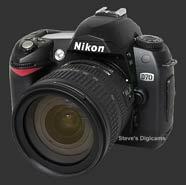 The D2H is the world's most responsive digital SLR camera. It has virtually no start-up lag time, and is ready to shoot the instant it is turned on. Its shutter lag time is a mere 37ms - the lowest among all digital cameras, and comparable to Nikon's F5 35mm film SLR camera. The D2H is capable of a continuous shooting rate of up to 8 frames per second at full resolution and all file formats and ISO settings. The frame rate remains consistent when any combination of the D2H's focus points is selected, or even when older, non-CPU based Nikkor lenses are used. The D2H's enormous buffer allows photographers to shoot up to 40 continuous images in JPEG mode and 25 in NEF (RAW) mode, rendering buffer-stall virtually a non-issue. The D2H features the new Multi-Cam 2000 next generation autofocus system that is not only fast enough to keep up with the camera's rapid continuous frame rate, but it is remarkably accurate in detecting focus even in challenging situations, including dim lighting conditions as low as EV -1. This new autofocus system consists of 11 AF sensors, 9 of which are cross-type sensors laid out consistently with the rule of thirds for composition, and an additional two sensors placed at the horizontal ends of the frame. The D2H also features enhanced Dynamic AF and a new Group Dynamic AF detection option, as well as Focus Tracking with Lock-On technology to ensure razor sharp pictures. The D70 is Nikon's most affordable digital SLR to date and delivers a combination of innovative features, robust performance and excellent image quality. Built from the ground up to be a digital SLR, the D70 incorporates a DX format 6.1-effective megapixel CCD sensor that is optimized to deliver images with excellent sharpness and clarity, and a new advanced system Large Scale Integrated Circuit (LSI) processor ensures images with vivid color, accurate white balance and minimized noise. The D70 offers AUTO, Program AE, Shutter speed AE, Aperture priority AE and Manual exposure modes plus seven pre-programmed Digital Vari-Program selections. The Digital Vari-Program modes produce great results with smooth gradations and rich tones even in the most complex shooting conditions. 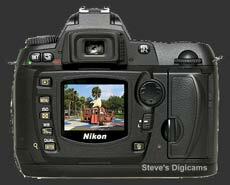 Nikon's new Dynamic Buffer technology allows the D70 to continuously capture up to 144 pictures at three pictures per second (when using JPEG NORMAL  Large image settings, and a SanDisk 256 MB Ultra II CompactFlash card). Additional features such as simultaneous compressed NEF (RAW) and JPEG writing capabilities, and new i-TTL flash compatibility with sync speed of 1/500 second puts the D70 in the lead in its class of cameras. 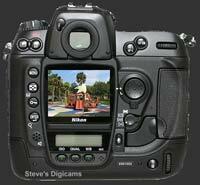 The D70's menus have been designed to offer quick access to the most often used features of the camera. Users will have a choice of customizing their menu to display simple or advanced options depending on their skill level. A unique help button on the camera temporarily displays a short description for each of the 25 different custom settings featured in the D70, offering users immediate help when customizing the camera settings. The built-in speedlight offers a level of performance that simply doesn't exist in any other digital SLR camera. Designed to be a part of Nikon's growing Creative Lighting System, the D70's built-in speedlight adopts Nikon's exclusive i-TTL flash control technology. The speedlight automatically pops up and fires when natural lighting is inadequate or to add balanced Fill-Flash when there is strong backlighting. In addition, i-TTL technology improves the accuracy of fill-flash exposure and white balance in a picture, by seamlessly integrating color information gathered from the speedlight’s monitor pre-flash with information from the camera's 1,005-pixel RGB sensor. The built-in speedlight can also be used in Commander Mode to remotely control a group of multiple wireless SB-600 and/or SB-800 Speedlights.